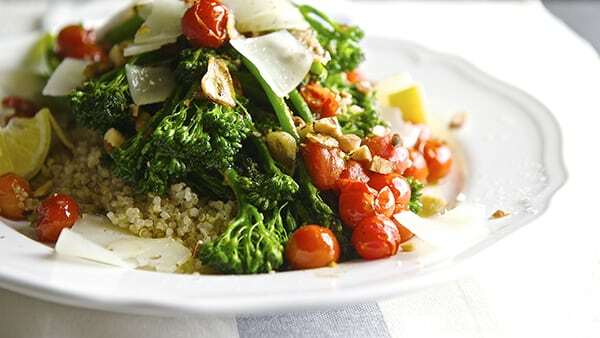 Sauteed Broccolini & Lemon Quinoa ~ Yes, more please! After the weekend taco indulgence, I’m craving Green! Green! Green! 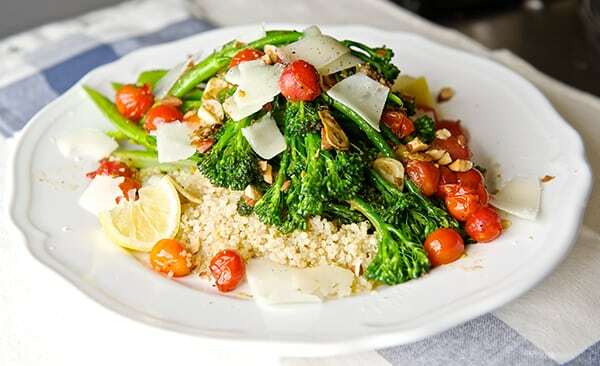 Broccolini it is a Hybrid between Broccoli and Kai-Lan commonly known by the name of Chinese Broccoli. 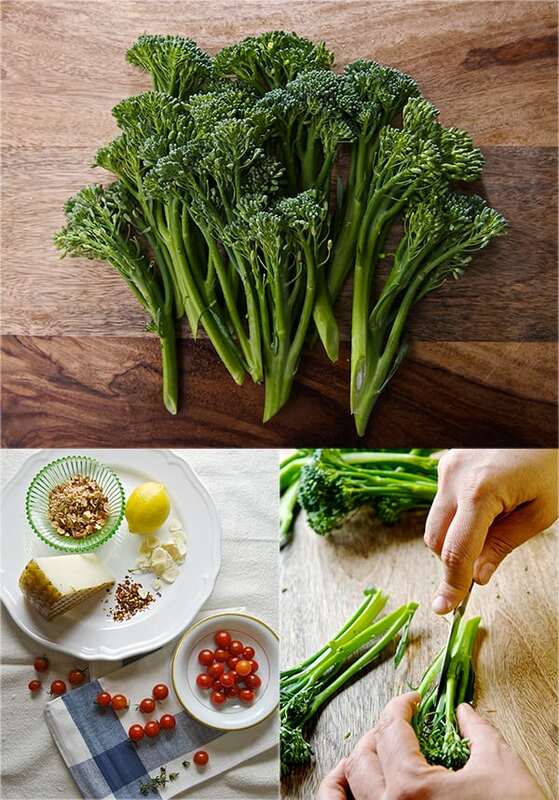 Broccolini inherited the best part of the broccoli, the little mini flowery tops and the long steams of the Kai-Lan. The juice and the zest of one lemon. Squeeze some lime juice right before serving.adjust salt and pepper. *eliminate the cheese if you are Vegan. Quinoa cooks just like rice, is 2-1 ratio. In a medium size pot bring the water to boil add the garlic cut in half add the salt . Once water is boiling add the quinoa, lower the temperature to medium, and cook for about 18-22 minutes, at this point add the lemon zest and cover with a lid remove from stove and let it cook with the residual heat. To avoid the blanching step, cut the broccolini stems in half-length wise (see photo above*). Heat up a large saute pan, add the extra virgin olive oil and add the broccolini. Toss and within 2 minutes, add the garlic, salt and pepper. Wait 1 minute, add the cherry tomatoes, lemon zest and squeeze some lemon juice. Keep moving the pan and toss the vegetables around. Once the tomatoes look like they are going to burst remove from fire add the tablespoon of butter, and toss. 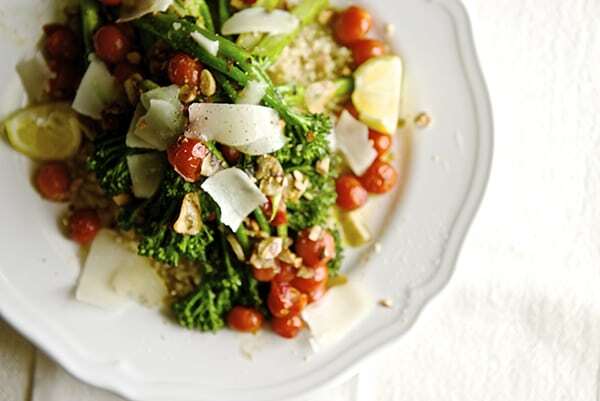 Fluff your quinoa with a fork, drizzle a little olive oil add salt and pepper to your taste. 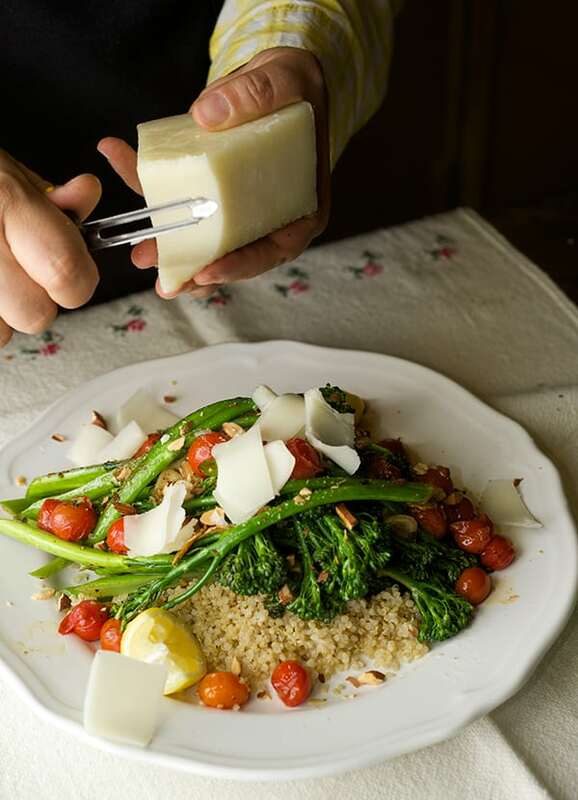 Promptly, on a large platter, serve the cooked quinoa topped with the sautéed broccolini and chopped roasted almonds, Manchego or Parmesan cheese shavings. Adjust with salt and pepper squeeze some lemon and drizzle a little more extra virgin olive oil to finish the dish.